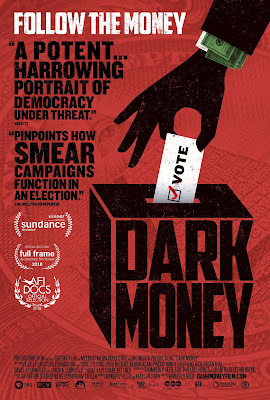 On Wednesday, June 20, 2018, Larsen Associates invited me to attend a special San Francisco screening of Dark Money (2018) at the Delancey Street screening room with director Kimberly Reed present to introduce her film and an after-film discussion with Reed and Ann Ravel, former Commissioner at the Federal Election Commission (FEC), moderated by Daniel Newman, President and Co-Founder of MapLight, an East Bay watchdog organization monitoring money's influence on politics. Opening at The Flicks in Boise, Idaho on Friday, August 24, 2018, and just in time to educate the public for Fall elections, Dark Money is infuriatingly informational. 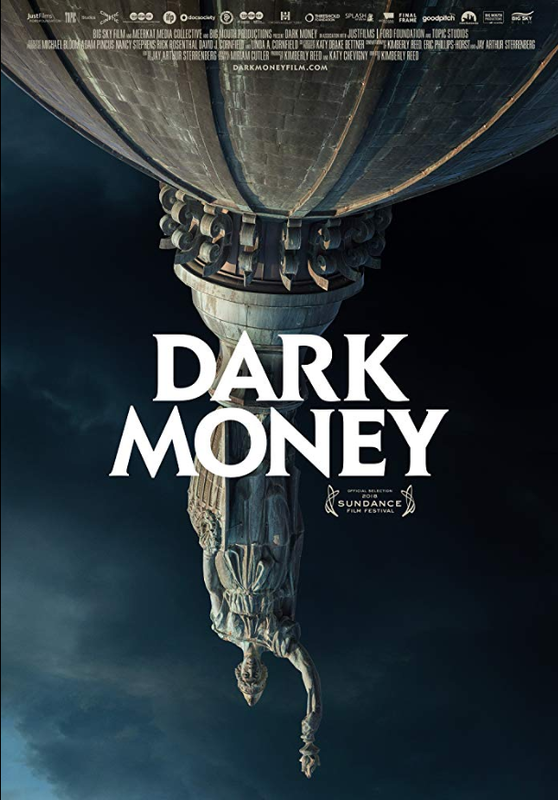 A winner of the Amazon Studios Production Award at Sundance, Dark Money succeeds in relaying how dark money trafficks behind a curtain of secrecy to buy (and thereby steal) democracy from the citizenry. As Dennis Harvey wrote in his Variety review, Dark Money is: "Potent! 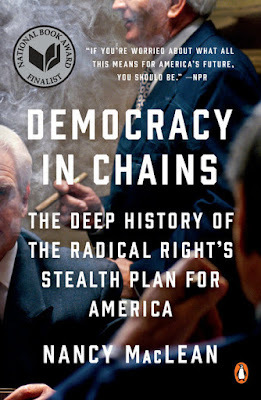 A rather harrowing portrait of democacy under threat, even if ultimately there is hope." It's this tangible sense of remedy that makes Dark Money an effective, and hopeful, working primer, even as administrative forces rally to make the disclosure of dark money increasingly difficult. Shortly after seeing the film in San Francisco, the IRS announced a policy shift that will allow dark money nonprofits to go almost pitch-black by no longer requiring 501(c)(4) and (c)(6) nonprofit organizations to provide the names of their donors. As detailed at Maplight: "The nonprofits, which are already known as 'dark money' organizations because their donors' names aren't disclosed to the public, have become high-profile players in U.S. campaigns by virtue of their ability to funnel unlimited amounts of anonymously donated money into elections and other political contests. Before the IRS announcement, however, the nonprofits were required to disclose the names of donors to the government. "Brendan Fischer, director of federal reform at the Campaign Legal Center, said the disclosure requirement 'was one of the few ways that the government could identify illegal foreign money in elections. Today, that requirement is gone. Dark money just got a lot darker.' "
An informed vigilant citizenry will now have to help light the way forward in order to preserve the democratic effect of their right to vote. Daniel Newman: Watching this film about what happened in Montana 100 years ago made me think of how here in California more than 100 years ago the Southern Pacific Railroad owned the legislature and the newspapers, and would even have the state write checks from the State Treasury directly to the corporation. It was in rebellion to that over the space of many years that the State of California passed an initiative where it gave citizens a right to recall. Why was it important to tell the story of what happened in Montana 100 years ago to tell the story of what is now going on nationally? Kimberly Reed: In general, as a filmmaker and as a storyteller, the challenge in telling a story about money in politics—which is difficult and abstract and gets complicated real quick—the most important thing was to find human faces to wrap this story around, and to make it about real people doing real things. Also, for viewers, to make them feel these issues about money in politics and corruption in their gut and not in that part of their brain that processes pie charts. We needed to find a story that we could get our arms around. What was happening in Montana—well, first of all, I'm from there so on a practical level I had access. I had a place to sleep and a car to drive. I knew I was going to be able to finish the film and follow it and be able to get access in a way that I figured I'd be able to walk the walk and talk the talk and have the access to the people that I needed to have access to. Having that access, it was clear that the flashpoint for a lot of these debates were actually happening in Montana. The same group of attorneys who were behind Citizens United were opening law offices in one other state besides their home office, and that was in Montana. We saw that they were going after these relatively strong campaign finance laws. You could see the pressure coming from that one side of this group of attorneys. But, also, having grown up in Montana and learning in grade school about the Copper Kings' battles for "the richest hill on Earth", I knew that there would be a pushback from the citizens who have a more built-in skepticism of the role of money in politics. Seeing that lay of the land, and hoping that there would be some drama that was going to build up, a drama that could be wrapped around real people, is what led me to follow that story. Daniel Newman: Ann, at the close of the film you read a letter of advice to President Trump. Did he take you up on your advice? Ann Ravel: Not only has he not taken me up on that advice, he's never even actually responded to that letter. Daniel Newman: The one thing that really strikes me is that as a Presidential candidate, Donald Trump pulled on this issue about the special interests in money and politics. The frustrating thing for me is—I'm simply trying to raise awareness of this issue better—while a candidate obviously used it to propel a story that he was doing something about it. I found it striking in a wonderfully positive way that you tell this story, as you said, without pie charts, without a lot of numbers, and that's a hard thing and an important thing to do. What else do you see out there in terms of media, or films short or long, what else needs to exist so that we can—hopefully, everyone in the country will see your film but probably no one's going to see any one film with everyone else in the country—so what else is needed? We have a lot of creative people here in this audience. What else can be done to spread this out there that doesn't exist? 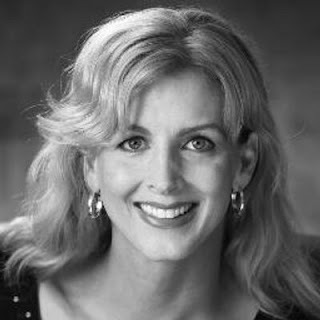 Kimberly Reed. Photo courtesy of the filmmaker. Kimberly Reed: Citizens United right now is the law of the land. Hopefully what our film points out is that it's all about disclosure. If you know where this money is coming from; if you ask for that; if you demand that as a voter; if you get involved and run for a public office—make sure that's part of your platform. As a voter, make sure you're holding your elected officials accountable on that level. That sort of public dialogue is what's really needed. It's something that started to happen in Montana after the 2008 and 2010 elections where voters started to pay attention to this issue and now, if you watch the dialogue, Jon Tester's running for re-election again in 2016, and part of the public debate is about this issue of money in politics. It's at the forefront. People are examining it and voting on that issue and that, more than anything, is what's needed to hold our elected officials accountable. Daniel Newman: I often tell people to join a group, like Common Cause, or my organization Maplight, because that way you're not just doing this by yourself; you're part of a collective effort. Ann, you served on the FEC and hoped it would be better than it was in terms of getting things done. Is the FEC important nowadays? What's going on there? What can be done? Ann Ravel: The FEC is clearly important. What was great about the film was showing how significant it was to have a regulator and an enforcer that was active and doing something about what they discovered. Because, also, investigative reporting is important in getting to the facts and having it out to the public; but, having that consequence is so important. And yet the FEC as it is now is worse than it ever was because I have been gone over a year, they have not filled my position, and one of the other commissioners has left so there are only four members. Congress doesn't seem to care. Obviously, the President doesn't care; they're Presidential appointments. That's really important because—as I think Jonathan Rowland said it, and it's true—the whole purpose of campaign financing laws is to assure trust in government. If you don't have what you think is a fair electoral process with people who are believing in the law and enforcing it, it's hard for people to feel that trust. That's another thing that I would add to the list of people's involvements. These are senate-confirmed appointments so you should talk to your congress people, your senators, and make it an important aspect of what they do for the disclosure that we need, and also to insure that there is somebody there watching. Kimberly Reed: I also wanted to thank Ann Ravel for her service here in California on the Fair Political Practices Commission. 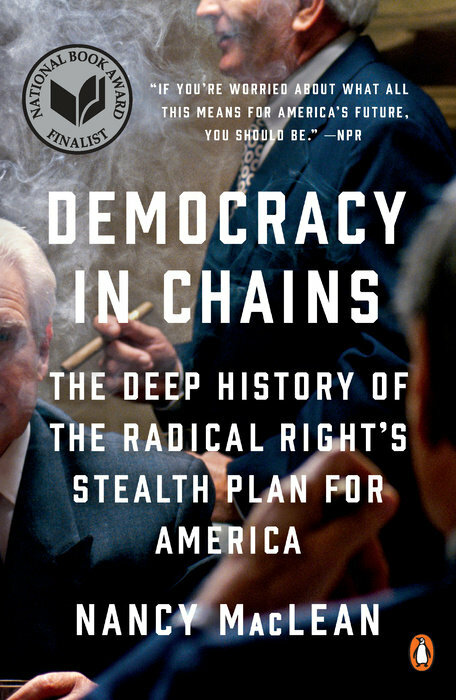 It's the first time, as you see in the film, that the Koch dark money network was broken open and disclosed. Thank you for that. Daniel Newman: What is the motive here behind the secrecy? There's been a concerted effort to keep things in the dark. Why is it so important? Kimberly Reed: Usually it has to do with issues that people don't want their fingerprints on. A lot of times it's environmental issues. You see that going on in the film here where people don't really want to be the person who created the Berkeley Pit that is killing a bunch of snow geese. I see it in a lot of civil rights issues, LGBT issues a lot of times. Montana's not this perfect place. You'll remember that the representative for the U.S. House from Montana, Greg Gianforte, is the guy who brought in the reporter from the Guardian during the elections. He was not only a recipient of dark money when he was running but also a major donor to prevent anti-discrimination clauses in his hometown of Bozeman, Montana. He basically wanted to shut down all of those resolutions from the city council saying we won't discriminate against LGBT folk. He was opposing that. Another example of not wanting to really own that argument. If he wants to express that or if he wants to articulate that in a public debate as policy, then I think he should be able to express that point of view; but, to hide that point of view in a 501(c)(4), a nonprofit group that's supposed to be for the social welfare...? I think he should put his name on it. Ann Ravel. Photo: Bill Clark/CQ Roll Call. Ann Ravel: Let me add, because the groups are dark and the 501(c)(4)s don't disclose their donors—they aren't required to do so even though they should be required to do so at certain points—we don't know who's actually contributing to them; but, the belief is that a lot of corporations do contribute to them and contribute to them through lots of other circuitous means, say first they give to the Chamber of Commerce and then the Chamber of Commerce puts it through either a PAC or a 501(c)(4) or some other group. The reason that they don't want it known is because there is backlash from the people who are the consumers of whatever it is that the corporation gets involved in, or has been, once it becomes public. It's not well thought-out because sometimes these things do surface publicly but that seems to be the reason why a lot of corporations when they give, give in that way. Daniel Newman: I'll add to that too. 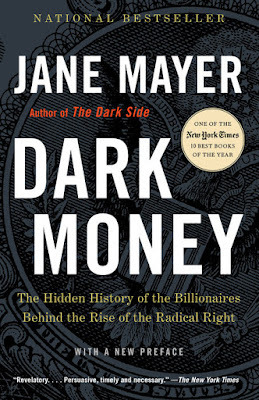 In reporting by Jane Mayer in the book Dark Money and in Nancy MacLean's Democracy in Chains, that the Koch Brothers in particular who fund a lot of these groups have a philosophy of overturning them, and it's just not popular, but they're not able to get past by lobbying. Kimberly Reed: I also want to point out that it's groups like Maplight that are investigating those corporate contributions and uncovering the roles of these corporations that is really crucial. Daniel Newman: Thank you. I want to take notice that Don McGahn, featured in the film in the Federal Elections Commission as one of the obstructionists, is now White House counsel. 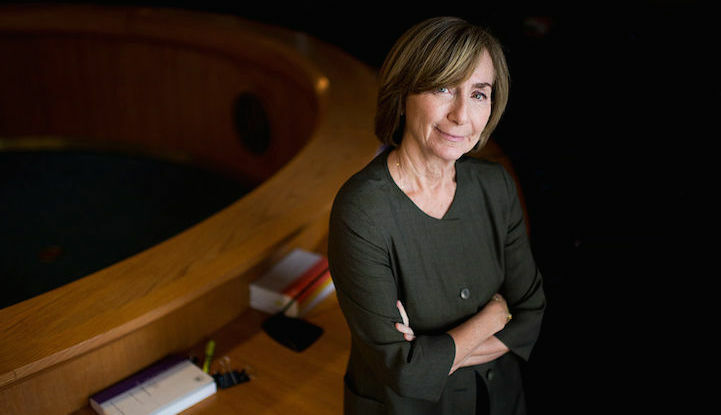 Ann Ravel: Actually, let me say that is why I said at the end of this film that I thought it was like a test case at the FEC because that was Don McGahn's test case of how to insure that a government agency can be totally dysfunctional. We are seeing now that it's true with many of the other government agencies that also exist for the protection of the public. Q: The Copper Baron you were mentioning was Senator William A. Clark. Did your film originally include more about him personally vs. his being generally grouped within the Copper Kings? He was basically the Rockefeller of Copper. Kimberly Reed: Unfortunately, there's lots of stuff on the cutting room floor. There's a beautiful chapter about Don McGahn and his role in the current administration and that's on the cutting room floor. Also, for those of you keeping score at home, do you remember about six to eight months ago Trump appointed somebody to stand for a position on the Federal Bench during his Senate confirmation hearing? It was revealed that he had never taken a deposition and didn't know anything about law? Remember that guy? He was the other guy at the FEC that you can see in some of the old footage beside Don McGahn. His name was Matthew Peterson. Ann Ravel: And he's still there. Kimberly Reed: But, yes, there was a lot about William A. Clark. He was one of the main copper kings. He is the reason that we have a 17th Amendment. The 17th Amendment led to the direct elections of U.S. Senators so that state legislators would not elect U.S. Senators. Long story short: he brazenly bribed members of the Montana legislature to vote him into office in the U.S. Senate. He actually got the seat after paying Montana legislators $10,000 each—this was back when state legislators voted for U.S. Senators—he paid them money on the floor of the Montana capitol, right? Went to Washington D.C. and the sitting senators at the time were so disgusted with the rampant corruption that was going on back in Montana that they refused to seat him, and that's ultimately what led to us having the 17th Amendment and also to the Corrupt Practices Act of 1912 that was passed. Q: Just to play the devil's advocate, the 17th Amendment was passed at the end of the Muckraker Era as a result of all the muckrakers. In your film you're basically showing in a very responsible state a terrific drama, but I wonder what will tip the national public conscience into this being a national issue? Because, again being a devil's advocate, Don McGahn is considered one of the good guys. He opposed a lot of the lawyers' recommendations to Trump and I wonder if the Kochs in any state have played to bigotry or uglier things in the state? This was a clean "citizens deserve a right to speak", but they're very dirty players. Do you think this issue is going to come to a national tipping point? What will tip this towards a national interest? Kimberly Reed: I think the core of your question is: "Okay, this is great that this has happened in Montana, but is that isolated or can this example be applied to other states?" Short answer? Two states with probably the strongest campaign finance laws are California and Montana. California, it's pretty understandable with a lot of presumptions that we make. Trump took Montana by 20 points and it also has really strong campaign finance laws. Long story short: If you can do it there, you can do it anywhere. There are maybe some exceptions that are a little bit unique: this long history of corporate exploitation leading to environmental disasters makes you attuned to the role of corporate money in politics and makes you skeptical of that. That's the devil's advocate part of your question, I think? There's always some way that we can vocalize our politics. I think this issue is going to move like marriage equality moved. We're going to have one city council, then another city council, then a municipal resolution that says, "We want to repeal Citizens United." And then another municipal resolution that's basically going to follow along, and another statement that's going to move from the bottom up, from local to national. We're already seeing lots of local resolutions. We're seeing state movement. My Dark Money Google alert is pinging all over the place in all sorts of states that were not happening two years ago. In this mid-term election, it really is happening. So, yes, by focusing on local politics, municipal politics, even school boards are starting to come up with a lot of these resolutions. People are fed up. Like you were saying, Daniel, in the last Presidential election cycle, all of the major candidates had the same position on campaign finance reform. They said this system is busted and we need to fix it and—whether or not they intended to fix it is a separate issue—but, it's clearly something that's resonating with the general public. I just have to believe with so much broad base support, that it's inevitable. Q: What was the fallout for the young woman from Colorado who testified? Kimberly Reed: Sarah Arnold is a real hero. I was just at a film festival with her in Telluride, Colorado, close to where she lives, a couple of weeks ago. She said that she fully expects retribution and she fully got retribution, not because of the film but because of her testimony in that trial. She basically went back to school to become a data analyst. She used to work as a political consultant in those same circles. She's had to reboot that. But it says a lot about her character. She knew it was coming, but she did it anyways, and she did the right thing. Interesting sidenote: Colorado is strange and unique in that they don't have a little house where the commissioner for practices to enforce campaign finance laws. They say that individual citizens have to bring suits. Sara Arnold is married to the guy in Colorado who has brought more suits than anyone else. The two of them have been making a big dent in campaign finance corruption in Colorado; but, just a couple of days ago, there was a State Supreme Court ruling—I don't know if you're following this—but, it basically shut that down and said that it's unconstitutional for citizens to be the main enforcers of this, which there's some sense to be found in that. But the upshot of that is that now—going into mid-term elections—there's not going to be anybody minding anything and nobody is going to have the authority to bring suit for campaign finance violations. Q. On a national level, all of this is tax-free. What's the difference between a 501(c)(3) and a 501(c)(4)? They're not mutually exclusive. The NRA has both. Ann Ravel: The difference is that 501(c)(3)s are not permitted to participate in political campaigns in any way. 501(c)(4)s, which are considered social welfare organizations, are permitted to do so but under both the IRS rules as well as the campaign finance rules. If they spend a majority of their money on a political campaign, then under the FEC rules they become a political committee and, thus, have to register and they have to identify their donors. They don't do that. That's the difference. Q: So the IRS is not enforcing their own rules? Ann Ravel: The IRS isn't enforcing it because—when they attempted to implement some rules many years ago—they were attacked by some Republicans in Congress, which is a fact, and they backed away from them and, thus, have not actually written any rules since ... I think it was about 2013 when that happened, 2012?, and the FEC isn't enforcing. Daniel Newman: Kimberly, Ann, any last comments? Ann Ravel: I wanted to say ditto to what was said before about reform and what might happen in other states and on the federal level. Even in California, where we have good laws, there is a lot of money that's coming in to whether they be judicial races or school board races and the like. At the Federal level, there has been more money spent by outside groups than were spent by the candidates and the parties combined, for the first time ever. So this is an issue that is increasing, it's not getting better. It's getting worse, if anything. I do think that this is a time when people who feel this way already need to mobilize and do more of what we've talked about, which is to be more activist about this situation. Kimberly Reed: I want to acknowledge our wonderful composer Miriam Cutler. Documentaries are made in the editing room and our editor Jay Arthur Sterrenberg was my co-storyteller in this. As a final wrap-up, I would just say that there is some scary, discouraging stuff in Dark Money. We all know that those dots are out there and, hopefully, one of the things that our film does is connect those dots and make you go, "Oh. So now I see how these dots work and see that there's proof." We were able to tell that story in Montana because of some bizarre revelations and accidental disclosures. This stuff is going on all the time and it's going on in other states all the time. I hope you're able to get a glimpse of hope that—because we see the game, because we know how that shell game works—we know that it's all about disclosure. Usually it's about a law that we already have on the books and just need to enforce. Don't forget this: even Citizens United says in an 8 to 1 sub-decision within that: the only reason we can find that moneyed corporations are people and Citizens United is the law of the land is because we're presuming that there will be disclosure. We're presuming that we're going to know where all this money is coming from. The key is disclosure. If they can do it in Montana, which is a pretty darn red state, then we can do it anywhere.